No matter how busy we all are this time of year, we always make time for family and friends. 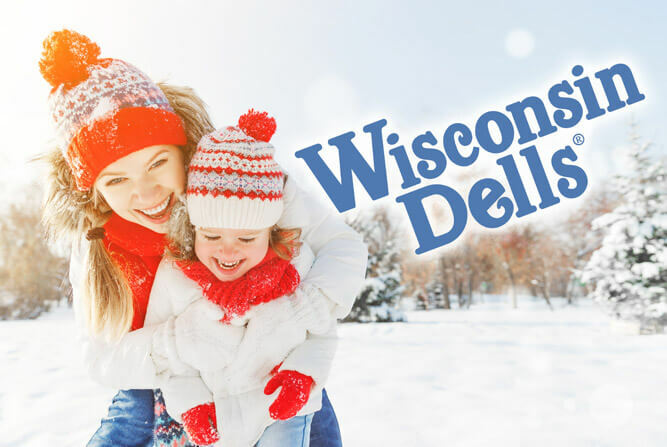 Why not plan a trip to Wisconsin Dells for the Holiday Season? There are plenty of things to keep your family entertained- from shows and events to venues and activities for all ages. Since this is the season of giving, we have that covered as well. Outlets at the Dells is your shopping headquarters. With more than 50 stores you are sure to find something for everyone on your list! For outdoor skiing and snowboarding activities, weather permitting, Christmas Mountain and Cascade Mountain ski hills have got you covered for hours of winter fun, both within minutes of Wisconsin Dells. Wisconsin Dells has many wonderful lodging options from cozy cabins and vacation homes to Resorts and Waterpark Hotels that are offering Christmas or Holiday Specials. Here are a few places to enjoy some holiday fun. For a home away from home feeling, reserve 3 nights at any of Sand County Vacation Rentals condos, cottages or homes and get the 4th & 5th consecutive nights free. Chula Vista is featuring a Santa’s Winter Wonderland Workshop known as Camp Chula, plenty of activities to keep the kiddos busy from Wagon Rides to Crafts and Scavenger Hunts. Mt Olympus Resorts is offering free tickets for skiing when staying with them. Check website for more information and details. Make the Holidays more memorable with a Snowland Suite at Great Wolf Lodge in Wisconsin Dells, with twinkling lights, decorations and decorated holiday tree. Snuggle in with evening milk and cookies for the kids. Wilderness Hotel & Golf Resort is offering visits from Santa starting Dec. 1st and 2nd in the New Frontier Lobby. Kids can also participate in writing letters to Santa, decorating Christmas cookies and craft projects. New this year advance holiday themed packages including two Wilderness metallic silver and green mugs with hot chocolate mix and marshmallows, mini candy canes, a Christmas ornament and story time book. Christmas buffets will be available to make your stay more complete. Please check with the resort for availability, dates and details.